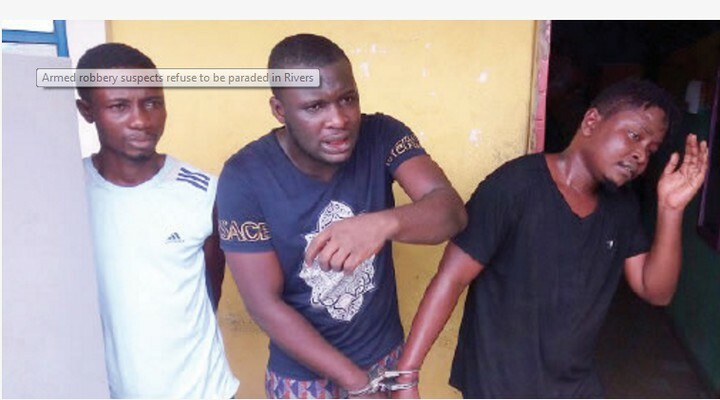 Three armed robbery suspects refused to be paraded before newsmen on Friday after they were arrested by a team of policemen from the State Police Command attached to the Rumuolumeni Police Station. The trio identified as Charles Harry, John James and Frank Anyaegbulem, gave policemen a tough time as they vowed that they were ready to be shot dead than allow themselves to be paraded before newsmen. They were arrested on Thursday behind a bar located at Mbaka Town in Rumuolumeni, where they were engaged in drinking and smoking of Indian hemp. On searching a hidden apartment behind the bar, the policemen, who were led by the Divisional Police Officer, Kingsley Chukwueggu, a Superintendent of Police, recovered various arms and ammunition. Efforts made by the policemen to parade them were not successful as the suspects insisted that they were ready to be shot dead than to be paraded. The suspects also refused to speak with newsmen, who wanted to get their own part of the story and why they were involved in armed robbery. However, Chukwueggu disclosed that the police recovered 25 rounds of live ammunition, 7.62mm loaded in a magazine, local revolver pistol with 9mm live ammunition and 32 pieces of live ammunition for AK-47 rifles..
Other items recovered, according to him, are one pair of Mobile Police combat trousers, three face masks, three refrigerators, three television sets, two DVD players and one pack of gunpowder, bag of Indian hemp, sachet of hard drugs and one generator. “On Thursday (22/06/2017) at about noon, we raided a bar after we were tipped off and discovered an apartment at the back of Ada Base bar in Mbaka Town. We arrested three suspects. “On searching the apartment, we recovered arms and ammunition and other items. The suspects are currently in our custody and would be arraigned in court as soon as possible. “One of the suspects escaped as he scaled the fence before we could get to him. But our men are currently on his trail with a view to arresting him and bringing him to book,” the DPO added. Speaking on the fight against crime in the state, Mr. Nnamdi Omoni, the State Police Public Relations Officer, warned criminals to stay away from Rivers or be ready to face the wrath of the law whenever they were caught. Omoni pointed out that the State Police Command would not go back on its charge in ensuring that crime was fought to a standstill. “Criminals should repent or stay away from the state before being caught,” he warned.